When reporters working on a recent series by ABC’s Evening News attempted to find products made in America they were amazed to find so few items available in stores. In fact, they featured a family home where not a single item in the entire house was American made. Had the film crew visited northern Delaware and ventured into Creations Gallery, they would have discovered over 2200 items from 150 small American businesses available for sale. As with most other areas of retail, the business of marketing and selling fine crafts has changed dramatically over the last few years. Several factors including the flood of off-shore products entering the country, the internet, the economy, the digital age and the new social media have influenced the nature of the gallery’s buying decisions. More than ever, Creations focuses on fine crafts from artisans with limited production and those that confine their sales to ‘brick and morter’ stores. Although a challenge for the gallery, the result is a unique buying experience for its customers. For those seeking special occasion gifts, Creations offers a wide selection of jewelry, keepsake boxes, animal sculpture, wall art, decorative tiles, artglass, kitchenware, toys, puzzles, and gift cards. Examples of distinctive pieces for the home include ‘farm-fresh’ furniture by Brad Smith, fine wood turnings by Avelino Samuel, Trees-of-Life by Brian Hooey and William Snell, pendulum clocks by Leonie Lacouette, wood sculpture by John Dickinson, bird carvings by Gordon Stennett and Wendy Lichtensteiger, fish sculptures by Paul Sumner and Alan Bennett and metal sculpture by William Wessel and Andrew Jacobs. Creations maintains one of the longest running business websites in the country. 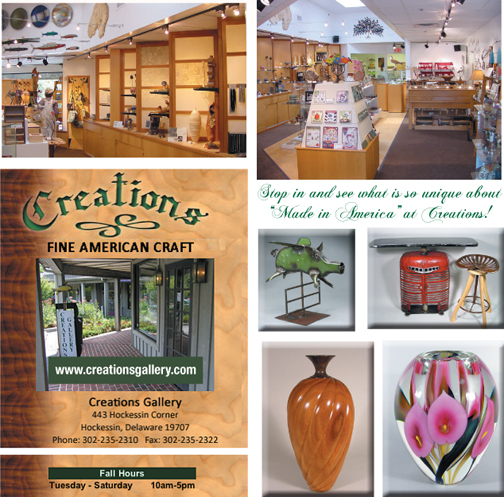 Since 1993 www.creationsgallery.com has allowed the gallery to reach out across the country. Internet sales are conducted by telephone avoiding shopping cart software and thus ensuring personal attention for web customers.